Jim and I started the New Year by visiting the ruins of Bective Abbey, Ireland's second Cistercian monastery founded in 1147 as a "daughter house" for Mellifont Abbey which had been founded just 5 years earlier. Picturesquely located overlooking the River Boyne, it was most likely an abbey of some importance -- the Abbot was a spiritual lord and sat in the Parliament of the Pale. The burial of Hugh De Lacy, Lord of Meath, at Bective in 1195 after his murder in Durrow created a rift with St Thomas' abbey in Dublin, and in the end his body was moved to that location. Even back then the abbey was considered to be strongly fortified. During the 15th century there was a decline in the number of monks, and the abbey was substantially reduced in size with demolition of the south aisles which in turn blocked off the adjoining arcades, truncation of the nave by the construction of a new west facade protected by a fortified tower, and construction of a second tower at the southwest corner of the cloisters. 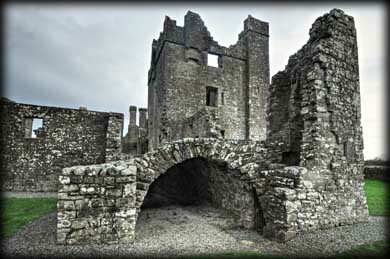 By the time all of the alterations were completed, Bective had become the most fortified Cistercian monastery in Ireland. The abbey closed in 1536 after its suppression under Henry VIII and was given to an English civil servant employed by the Dublin government who built a massive manor house around the two sides of the old cloister court which included the two towers. Its altered appearance looked so much like a castle that it was used in filming the movie 'Braveheart'. Nothing remains of the earliest 12th-century monastic buildings. The earliest stone work dates from 1274 and includes five bays of the south arcade. Also remaining are the claustral and conventual buildings that were reconstructed in the 15th Century. 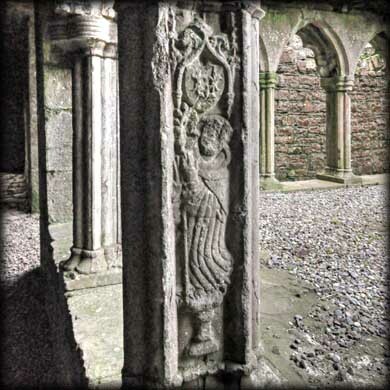 Fortunately the cloisters are beautifully preserved and include a fantastic carved pillar of an Abbot with a crozier kneeling on one of the cloister pillars, see photo above. It is thought that he was probably the abbot responsible for building the cloister. Bective is beautifully situated in rolling pastureland with a very enjoyable short walk to the ruins, perfect for exploring any time or season. 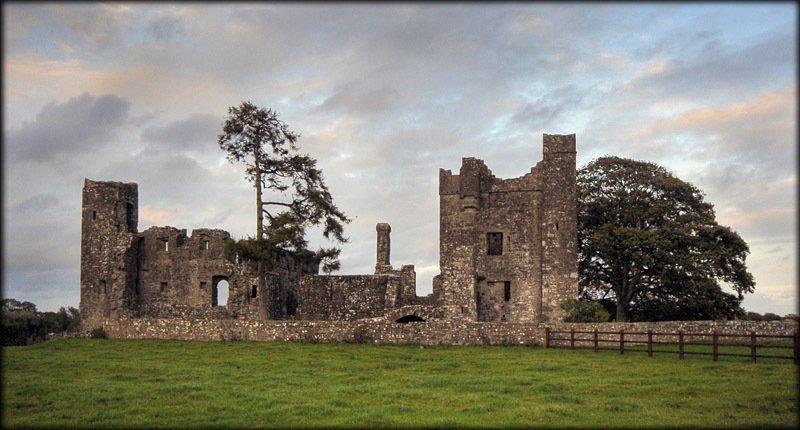 Situated: From Trim in Meath head north on the R154. Turn right onto the R161. After 6 kilometres turn right onto the L4010. The Abbey is down here on your left. Discovery Map 42: N 8590 5995. Last visit Dec 2011.